Spicy Homemade Pulled Pork Ramen. If there was ever a time to swan dive into a bowl of soup. It would be NOW. Seriously. Though I don’t know if I could do more than doggy paddle to save myself from drowning in the chili garlic broth of life. Oh hiiiii! Tell me, why did the weekend go so fast? Are you seeing Christmas lights everywhere you go? Have you heard the depressing Christmas Shoes song yet and/or the catchy yet awful Same Auld Lang Syne and wondered if you’re going to run into your high school sweetheart in the grocery store? Oh wait, probably not since you know their whole life story (and general whereabouts) from Facebook. Creeper 2015 status. This was the shortest yet longest yet wonderful weekend ever! Last night we had what I think would be our final plate of Thanksgiving leftovers and to say I’m stuffed and over stuffing maaaay be an understatement. I’m craving something new and normal and un-holiday like, which is huge. Our weather was ridiculously warm last week, unseasonably near 70 degrees and I even had to order an ICED eggnog latte and turn up the AC full blast this time of year. Because you know one of the worst parts of living in a chillier climate: you have to get all bundled up to go outside but then once you’re indoors or even in your car, you are having a full fledged overheated hot flash meltdown, not because of hormones but because of, hello, WINTER, and then you’re wearing boots and fuzzy socks and leggings and fleece and gloves and a hat and a down puffer coat and have to turn your air conditioning on to the highest settings and drive with your windows down while hanging you’re head over the side like a dog. This is normal life, I swear. Way back in the day, like we are talking seventh or eighth grade, I had certain snacks that I’d eat after school. Sometimes it was pretzels dipped in peanut butter (not much has changed, whomp whomp) but other times, it was the ramen blocks from the grocery store in chicken, shrimp or beef flavor with the seasoning packet. And I was the only one who liked them – my brothers wouldn’t even touch the stuff. But then again, what do they know? They opted for frozen chicken patties and potato chips dipped in KETCHUP. Ugh. Excuse me while I go die now. Anyhoo, I made my first homemade ramen a little over a year ago using Stephanie’s recipe and it was so, so delicious. And easy too! I actually couldn’t believe how easy, which meant I sort of had to complicate things here. First up, you need some pulled pork. This is a great meal to make if you have leftover pulled pork – who cares how it got there? Slow cooker, oven roasted, stovetop – whatever works, as long as you end up with some delicious pork that you want to repurpose. And! Let’s talk about all the freaking flavors. and thinly sliced cucumbers too. and toasted sesame oil, my love language. and a soft boiled egg, of course. One day I’ll stop with the eggs. Maybe. This bowl is just such a seriously love hug. And you can obviously make it with some chicken or even do a veggie version if you wish. Like I need to give you permission. Ooomph. But really, the more color the better. The more flavor, the better. The spicier, the better! It’s the one time I can get behind lots of spice. It completely will warm you up on the coolest of nights. And not to mention, give you something other to eat right now for dinner besides Christmas cookies. But I wouldn’t know anything about that. Hmmpf. 5 cups low-sodium chicken stock, or veg stock, or even beef stock! First, if you want to cook pork specifically for this recipe, I recommend this oven roasted version or this slow cooker version. Heat a large skillet over medium heat and add the butter. Once melted, add the mushrooms and garlic and toss. Cook until the mushrooms are soft and juicy, about 5 minutes. Set aside. While the mushrooms are cooking, bring the stock to a simmer. Stir in the soy sauce and hoisin sauce. Cook your eggs too! I like to soft boil mine – but poaching is good too. Place the ramen blocks in two large bowls. Add the pork, scallions and a few cucumber slices to each bowl. Pour the stock over both blocks evenly and let sit for 2 to 3 minutes before stirring. Add mushrooms to each bowl and stir in a few more cucumber slices. At this point you could separate into two more bowls if you want 4 servings. Stir in the chili garlic paste (I do about a tablespoon per bowl for SPICY!) and add your egg and nori sheets. Sprinkle with sesame seeds and drizzle with toasted sesame oil. Serve immediately. I’m really sailing my dreamboat along up there. Oh my eyes, this is BEAUTIFUL! The pictures are stunning and I love the idea of repurposing pork in anyway it’s cooked! Get me a spoon and lets dig in! I love upgrading ramen from a midnight college meal to something special and filling. I especially love it spicy and with some pork. I’ve got to try this recipe! thank you for commenting and reading nathalie! That is the fanciest ramen I ever done seen. Looks so darn gurrrd. Holy crap that looks deathly good!!! 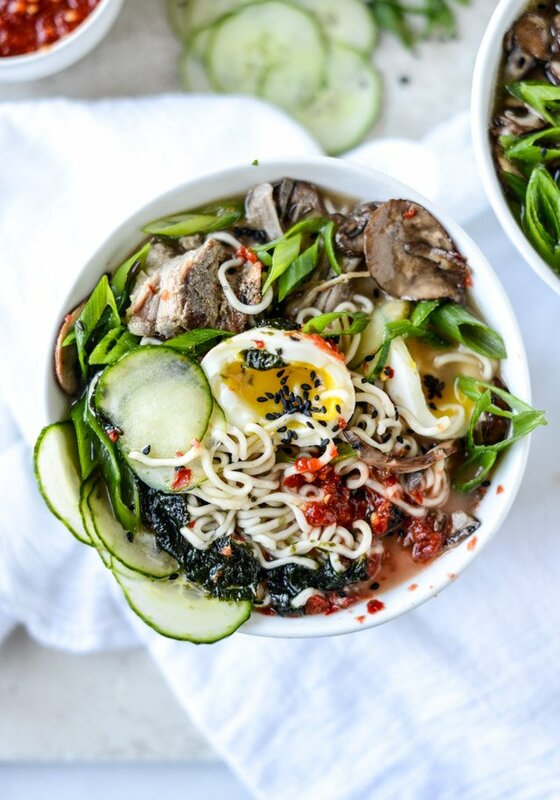 This ramen looks amazing! I need it in my life right now. I’ve been trying out lots of different ramen recipes recently. My kids love the stuff in the package – ugh, so much sodium! This looks perfect for a Thanksgiving food detox! i can’t believe i used to love the sodium laden packets too. must be a kid thing! I love Ramen! My husband and my love for ramen was solidified when we went to momofuku in New York earlier this year. This recipe looks so good and accessible! I will have to try it out! I’m into this so hard, I’m actually drowning in the bottom of the bowl! A tangle of tender pork and noodles and spice and crunchy veg and seeds annnnnnnnnd I’m dead. Slaying as always Jess! I would gladly take a swan dive into that glorious bowl of ramen! Biz!! I’ve totally noticed. Next thing you know, you’ll be eating an onion raw like Eddie. Ick! I’m not a fan of winter, but I can definitely get on board with all these Christmas lights … and this AMAZING pulled pork ramen! I could 110% go without hearing Christmas Shoes this whole season, because I become an absolute mascara smeared sobbing mess, and let’s be real – that brings the holiday spirit to no one. Woof. But please, let me enjoy this ramen and NOT cry over sappy songs!! Yep. I’ll be making this! 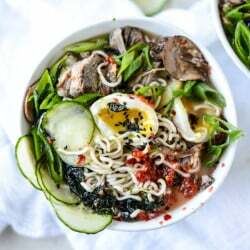 If you don’t want to buy oodles of noodles you can usually find ramen noodles in international food aisles… and can usually get baked instead of fried noodles so it’s healthier. I have been making this with chicken instead of pork for a few weeks now and I’m OBSESSED. Got your pork in the oven this afternoon and I’m psyched to taste it. This recipe has changed the way I think about soup, it’s that amazing.